Here's how you can join the cryptocurrency revolution - in three simple steps. 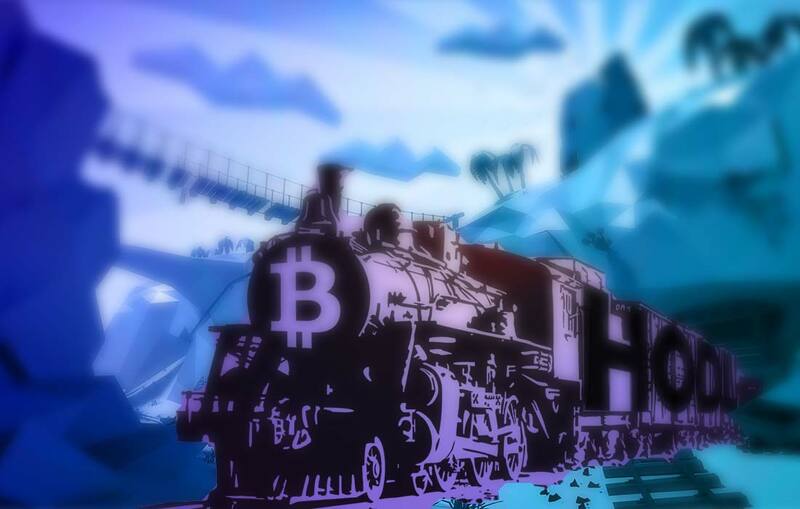 Cryptocurrency is one of the most exciting investment opportunities of our time. …it's just a shame it's so complicated. If you're asking "How do I buy cryptocurrency? ", "How do I store cryptocurrency?" or "How do I send cryptocurrency? ", this guide is for you. It'll take less than 30 minutes, and you, too, can have Bitcoin, Bitcoin Cash, Litcoin or Ethereum sitting in your wallet ready to go. From these four starter currencies, you can exchange for many, many more. Using your debit card, credit card or bank account, you can purchase Bitcoin, Litecoin & Ethereum on Coinbase. Whilst there are other ways of buying cryptocurrency, such as BitBay & LocalBitcoins, Coinbase is the platform we use and recommend. they're covered for an amount "greater than the value of digital currency we maintain in online storage"
We'll both get $10 USD worth of BTC when you buy $100 USD or more in cryptocurrency on Coinbase when you sign up with the link above! Like all digital asset exchanges, Coinbase charge a fee. 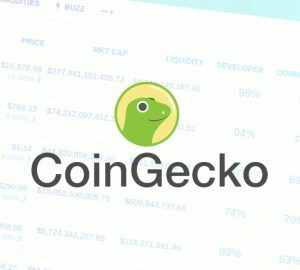 According to their site, there's a base rate of 4% per transaction. It usually takes around 15 minutes – longer if you're in a country with stricter verification requirements. Why do I have to verify my ID? Because of money-laundering regulations. It could also be a useful way for the government to connect your identity with your cryptocurrency transactions – tracking your every move. It's for your safety, citizen. In Coinbase dashboard, click "Buy/Sell"
Click "Buy Bitcoin Instantly" and "Confirm"
Right away, the Bitcoin you've purchased will be available in your account. 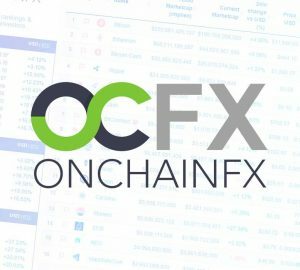 You're now part of the crypto world! With crypto, you are your own bank. That means you've got to keep your funds secure. To do this, you'll need to set up a wallet. A wallet is a piece of software you can install which lets you hold and manage your cryptocurrency. Some wallets (multi-coin wallets) let you store multiple cryptocurrencies; others only support one currency. ﻿This is a unique address for each wallet. People can send money to this address. 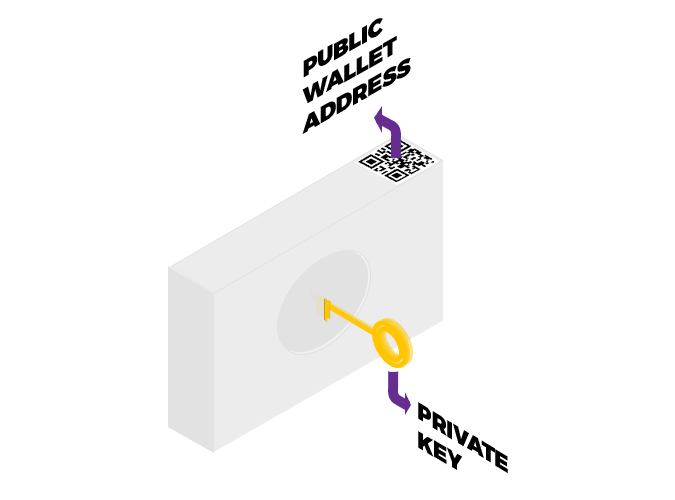 Each wallet has its own unique key which controls the wallet. ﻿Don’t share your private key(s) with anyone. ﻿Can't I just store my cryptocurrency on Coinbase? You can, but, with Coinbase, you don't control your private keys, meaning you don't have full control over your money. You're also limited to only Bitcoin, Litcoin & Ethereum – and not the many altcoins. When you send cryptocurrency, you pay a transaction fee to the network. This fee varies, depending on the currency you're sending. A good first wallet to try is Jaxx – the most widely available multi-coin wallet. If you're on Android, Coinomi is a great alternative. apps available for Windows, Mac, Android, iOS and Linux. You can sync your wallet between devices. If you'd like an alternative to Jaxx, try this useful wallet comparison tool. It'll ask if you want to run the express or custom wallet setup. Select express. Next, pick which currencies you want to be able to hold﻿. Within Jaxx, each cryptocurrency has its own wallet, each with its own address. Then, click "Take me to my wallet". You'll then see your freshly created wallet. 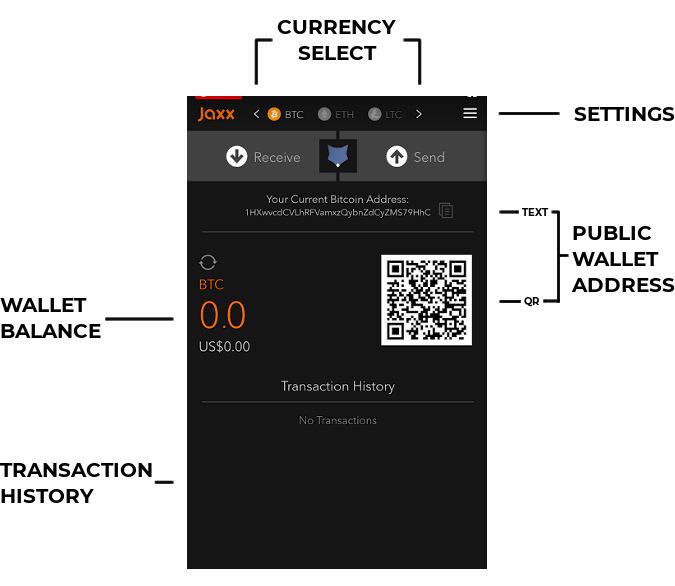 The basic features in a Jaxx wallet. The amount you've sent (and the small transaction fee) will immediately leave your wallet. Your wallet balance will update when the transaction confirms. You'll be given a set of 12 random words which can be used to recover (or access) your wallet from another device. Make sure you write down this backup phrase in a few different places. If you lose your backup phrase, you'll lose your cryptocurrency. Store your 12 word backup phrase securely. We recommend storing it physically in multiple locations. Then, Jaxx will ask you to input a four number PIN. Enter it twice to confirm. Make sure you don't forget it! Switch over to Coinbase and navigate to "Accounts"
Under your BTC Wallet click "Send"
It may take a few minutes to get to your wallet. That's it! You now know how to buy Bitcoin and send Bitcoin to your secure wallet!